I’ve had a bottle of Bärenjager burning a hole in my bar for a while now, and I have found it to be tremendously un-useful. It’s a delicious dessert, stirred over ice and with a dash of bitters, but as far as mixing into drinks, it’s a loser. The honey flavor, so engaging on its own, is easily lost among other spirits. I had originally wanted to use it to make the Bee’s Knees, a classic gin sour using honey instead of sugar, but what I found was that the proportion of the liqueur had to be increased substantially before the flavor of honey was discernible, and by then the resulting drink was far too sweet. Stick to honey syrup for a more pronounced honey flavor. The temptation exists to try pure honey, but it does not integrate well with more aqueous elements, and will sink to the bottom of your shaker or blender, spitefully refusing your entreaties. Combine in a sauce pot on medium heat until fully integrated. Fortify with a bit of vodka or a bit less of a neutral grain spirit. I used Bärenjager for this drink, and it worked pretty well, but you can get the same flavor in a six dollars worth of syrup as in thirty plus dollars worth of liqueur, and then you can spend the money on better rum. Muddle the blackberries in the honey liqueur or syrup until you have a fresh honeyed jam. Shake all ingredients over ice and then double strain into an old fashioned glass over fresh ice. 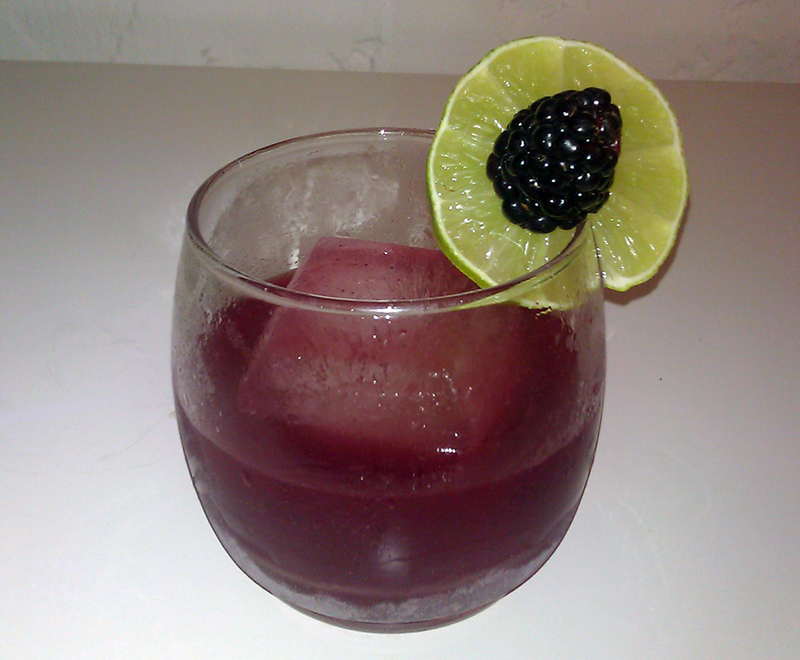 Garnish with a lime wheel and a blackberry. I used a toothpick, cleverly positioned, to make the blackberry stick to the lime wheel. Blackberries and honey both seem like ingredients which would be very enticing to bears, and I don’t know if that also goes for rum, but if I were a bear, I’m pretty sure I’d be all over it, and then I’d take a nap, hence the name. Simple creations are often the best ones, and this is a seasonal drink that I would be proud to serve to any guest. There are no bitters in this drink because the blackberries on their own have a bitter component to them, and they complete the back-end of this drink unassisted. Categories: original creations | Tags: blackberries, blackberry, booze, cocktail, cocktails, dark rum, drinking, drinks, honey, lime, mixed drinks, muddle, muddled, rum, sour | Permalink.